"Bee. n. 1. The animal that makes honey, remarkable for its industry and art." 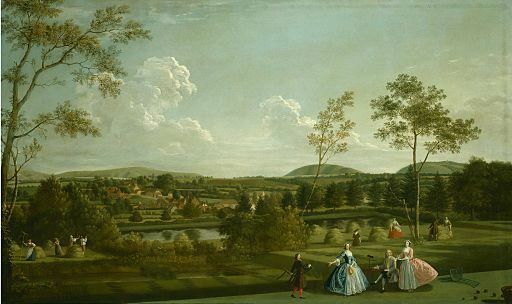 English Gardens in the eighteenth century. Gardens became less formal and returned to a more natural look, showing a return to nature. The eighteenth century was a time of political change and revolution. It birthed classic literature such as Robinson Crusoe and Gulliver’s Travels. There were great technological advancements that ranged from the steam engine to the sewing machine. Even gardens changed during this time, moving from ultra-groomed to a more natural look. But this exhibit is not about anything so large or grandiose. It is about a small, prominent contributor to society: the honey bee. In order to understand the bee and its role in society, this exhibit will be looking at how the bee is was used in poetry in the eighteenth century and in the literature and culture of the twenty-first century. Why is the bee so prevalent in literature through the years? The real beginning is likely found in ancient times in lands flowing in Biblical milk and honey, but for the sake of brevity, we’ll start in the seventeenth century. This century helped set the tone for bees as more than mere insects: they are divine. In 1609, the “first widely-read beekeeping manual composed with English beekeeping practices in mind” (24) was written by Charles Butler. However, this book wasn’t just about beekeeping, it also highlighted the deep religious ideas help about bees. Adam Ebert, associate professor of history at Mount Mercy University states that “Authors like Butler drew a large measure of their enthusiasm from the feeling that the organization and character of the hive must reveal God’s power and integrity” (25). There were certain aspects of the bees that resonated with people of the time, such as how God created bees with a perfect monarchy. The eighteenth century set a new tone for bees through writers like Bernard Mandeville with his poem “The Grumbling Hive.” Instead of showing the bee as a perfect species, they were given vices and committed sin. Later, Mary Leapor used the bee as a symbol of her discontent with her role in society. And even in the newly formed United States, Philip Freneau used an inebriated bee to caution people about letting independence go their heads. But even though the bee was being used negatively, it was still being used regularly and successfully. With this long, distinguished history, it’s not surprising to see the bee as a common symbol in the twenty-first century. As humans have grown slowly away from the natural world, we still turn to nature to define who we are and what our place is in society. 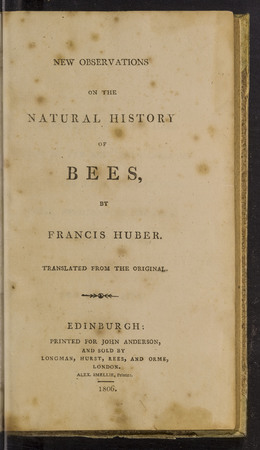 This exhibit will look at eighteenth-century poetry and how the bee was employed as a symbol for society over two hundred years ago and is still in use in American culture in the twenty-first century for similar societal themes, showing the innate tendency humans have for finding meaning through the use of nature and how the bee is used to find this meaning. Ebert, Adam Wayne. “Hive Society: the popularization of science and beekeeping in the British Isles, 1609-1913.” Graduate Theses and Dissertations. Iowa State University Digital Repositories, 20009, http://lib.dr.iastate.edu/etd/10587. Huber, Francis. New Observations on the Natural History of Bees. 1806.